Heat oven to 375°F. Place Reynolds Baking Cups in each of 18 regular-size muffin cups. In large bowl, beat granulated sugar, 1/2 cup butter, the molasses and eggs with electric mixer on medium speed, or mix with spoon until well blended. Stir in flour, baking soda, salt, ginger, 1/2 teaspoon cinnamon, the allspice and water. Spoon about 1/4 cup batter into each muffin cup. Bake 15 to 18 minutes or until toothpick inserted in center comes out clean. Cool in pans 5 minutes. Remove from pans; place on cooling racks. Cool completely, about 20 minutes. Meanwhile, in medium bowl, beat cream cheese, 1/4 cup butter, the lemon peel, 1 teaspoon cinnamon and the vanilla with electric mixer on low speed until smooth. Gradually beat in powdered sugar, 1 cup at a time, until smooth. Beat in milk, 1 teaspoon at a time, until spreadable. 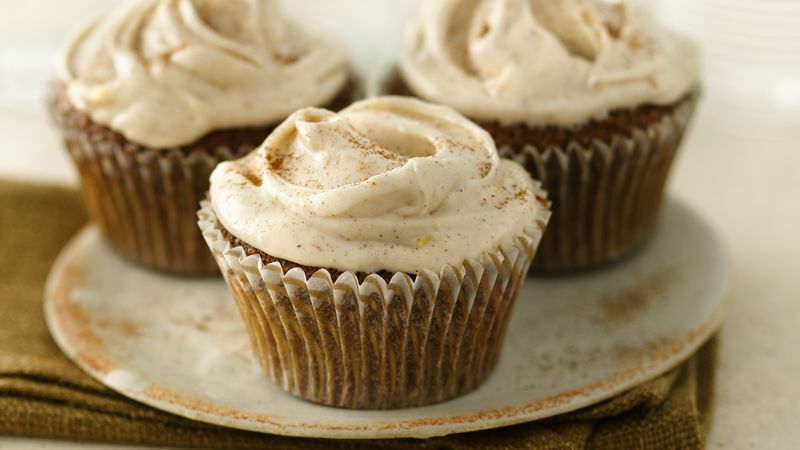 Pipe or spread generous amount of frosting on top of each cupcake; sprinkle lightly with cinnamon, if desired. Store covered in refrigerator.